The clue is in the name…easy to convert between portrait and landscape, this highly versatile poster display is ideal for a huge range of applications. Description All your Portland Menustand will be sent as individual units by parcel delivery. Your Portland Menustand will be sent in two separate deliveries – one by pallet, one by parcel. Telescopic pole for easily adjustable height. Simple ‘clip and slide’ mechanism for height adjustment. Quick and easy to change between portrait and landscape. Display angle easily adjustable between 0 and 90 degrees. Front opening snapframes for quick and easy poster change. All adjustments made by hand, no tools required. 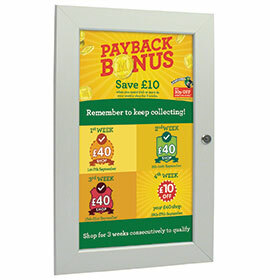 Anti-glare PET poster covers ensures clarity of message. Base features hidden steel plate for optimum stability. Available in A4 and A3 stock sizes.